In 1999 Jean Van de Velde, a French golfer, came to the 18th hole on the final day of the Open Championship with a three shot lead and (as most of you probably know) scored a triple bogey ending up tied with two other golfers. In the ensuing playoff, he and Justin Leonard lost to the Scotsman Paul Lawrie. French golfers at the Open had seen better days. 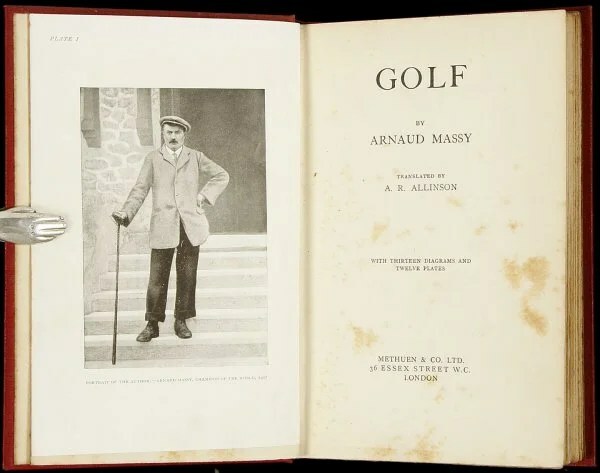 One hundred and two years earlier Arnaud Massy won the event beating the three British greats of that time, Harry Vardon, J.H.Taylor and James Braid among others. In the 1922 Open Championship, Jean Gassiat, a contemporary of Massy’s, came in seventh. A second contemporary, Baptiste Bomboudiac, was the subject of a golf poem written by Robert K Risk and first published in the English magazine Punch in April 1908. Risk, maybe the best golf poet of his time, responded to this quote with the following poem. And eke of Harry V.
For the record, James Braid won the 1908 Open and Arnaud Massy was tenth. Neither Gassiat or Bomboudiac are listed among those with four round scores. One more thing. If anyone knows more about Baptiste Bomboudiac please leave a comment. A Google search only produced two references. He deserves better.